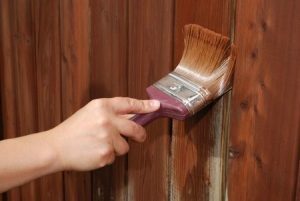 How to Properly Maintain your Wood Fence | All Around Fence Co. Inc.
A wood fence can provide privacy and safety for your family and animals, and can be used for farm fencing as well. Fencing can last for many years, but proper maintenance is an important part of this. Here at All Around Fence we use western red cedar because of its longevity and resistance to warping. When purchasing wood fencing, be sure to choose a pressure treated option. Pressure treated wood will make your fencing resistant to bug and water damage. Choosing treated posts is most important, since these pieces are placed in the ground. Avoid damage to your fence by keeping it clear of branches and debris. Remove vines that grow across the fence as well as any branches that touch or lean against it. Be sure to place sprinklers away from your fencing to reduce water damage as well. Constant watering will cause the wood to rot faster. As boards are damaged, remove and replace them with new ones to create a uniform look. Especially for wood that has not been pressure treated, sealant will provide protection from insects and the elements. How do you know when it is time to apply sealant? Watch the wood to see if water is beading up on the surface or soaking in. In most areas, wood will stay protected for about two years. Sealant provides a natural wood look and can be coated in stain to your fence a particular hue. To learn more about home and farm fencing options, visit us online or at our Uniontown, Pennsylvania store. Located at 7896 National Pike, we are happy to help you with all of your fencing needs.